I grew up in the art communities of Warsaw, Kyiv, Toronto and NYC. My earliest memories are of ‘hanging out’ on the gallery floor of Pracowinia Dziekanka along with the children of other artists from central and eastern Europe. I spent much of my teens ‘waiting for Onuch’ at ICAN and the Open Society Foundation’s Soros Centers For Contemporary Art meetings, and international Biennales and thus, I got to know the landscape of post-communist contemporary art and gained an understanding of the complexities of the politics of art and culture in democratizing contexts. In summer 2001 I completed my OAC art project and hosted my first art exhibit in Toronto. The series was awarded the highest grade in my cohort and included floor to ceiling portraits of ideal archetypal women. The portraits were coupled with a soundtrack and a lyrics album. In the album, each song was accompanied with an original black and white photograph. The photographs were part of a series of portraits and live action shots taken around the city of Toronto. Since 2007, I have been an active member of the Nuffield College Art committee. In 2009, I coordinated, along with Jerzy Onuch, a series of workshops, exhibits, installations and a symposium entitled Revolutionary Moments. We invited academics, artists and activists to a series of events in order to explore the intersection between protest and art during moments of mass-mobilization or Revolutionary Moments in Ukraine in 2004 and Poland in the 1980s. ‘Revolutionary Moments and Movements’ also became the title of doctoral thesis. In 2011, I helped organize and participated in an event dedicated to video installations by young Ukrainian artists at The Museum of Modern Art, Oxford. In 2013, RoseLee Goldberg and I discussed the connectivity of protest and art and visual representations of the langu age of protest in preparation for that year’s PERFORMA. 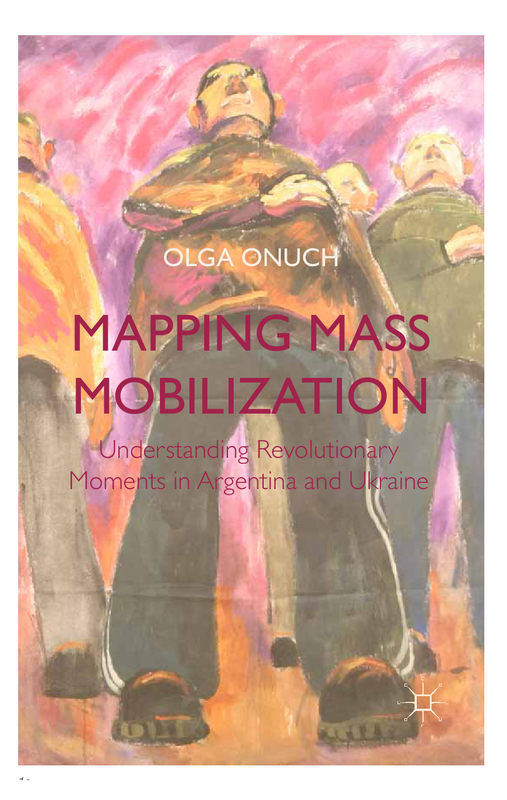 My book Mapping Mass Mobilization published in 2014 features on the cover, a photograph (by Roman Brewka) of Lesia Khomenko’s (of the group REP) painting – which she painted of the protesters on the Maidan in winter of 2004, during the height of the Orange Revolution. We coordinated an event dedicated to her work and my book in Kyiv in May 2015 at Knyharnia Ye. In 2015, I was a speaker at the UK premiere screening of the documentary ‘All Things Ablaze,’ at the Frontline Club in London. In 2018, I gave a lecture “The Art of Protest and Protest Art”, at the opening of the Photo Exhibition: Revolution of Dignity in Ukraine, at The Depot in London. In 2019, I gave a lecture “The Art of Revolution,” at the closing of the Exhibition: “REVOLUTSIYNO/Revolutionary”, at The MYSTETSKYI ARSENAL in Kyiv. I am currently working on longer-term book project assessing political images and election campaign adverts. If you are an artist who is interested in collaborating on a project, please do get in touch!